Paul Rudd and Evangeline Lily, who respectively play the title characters, said being the immediate follow-up to the $2 billion success of “Avengers: Infinity War” is intimidating, but also exciting. Lang’s actions in “Civil War” lands the shape-shifting superhero under house arrest, but Hank Pym and Hope van Dyne -- played by Michael Douglas and Lilly -- approach him with a mission. 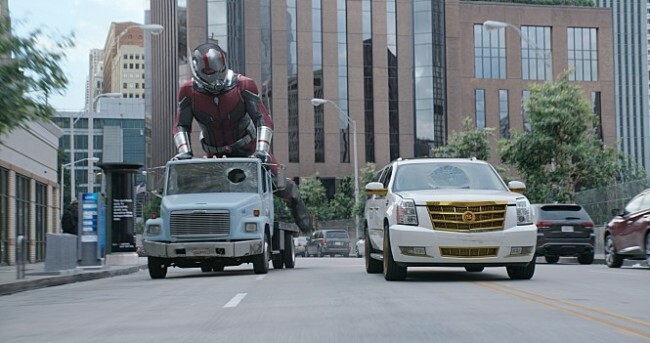 He now teams up with Hope as winged hero Wasp and once again suits up as Ant-Man. The duo talked very little about the film due to Marvel’s strict no-spoiler policy, including concerning the widespread rumor that the characters’ adventure in the quantum realm will affect the upcoming fourth Avengers installment. But they said the relationship between parents and children could be part of what sets the film apart from other MCU films. “Family tone, the humor and the fact that we’re playing people who are not born with superpower,” said Rudd, talking about why his character -- seemingly the only MCU hero most worried about making ends meet -- is relatable to general audiences. “It takes place on earth, not on outer space, and it is a particularly relatable movie in the franchise,” said Lily. “Ant-Man and the Wasp” will opens in Korean theaters on July 4.